Each 8 x 9 ¼ in. Though the Association of American Painters and Sculptors was an all male organization, of the roughly 304 artists who exhibited at the Armory Show, 50 were women. Dimock lent a group of eight watercolors. Dimock’s watercolors demonstrate an interest in working class life characteristic of the Ashcan school. However, unlike her male Ashcan colleagues, she focused primarily on the daily experience of women and children . Works like these allude to female relationships and concentrate on sites of female social interaction. Dimock’s illustrational aesthetic employs vibrant color and loose brushwork to lend a humorous and lighthearted quality to her images of rosy-cheeked women. All eight of Dimock’s watercolors were purchased from the Armory Show; nos. 116-121 were sold for $280 to George E. Marcus, and Sweatshop Girls in the Country and Mother and Daughter were sold to John Quinn for $35 each. 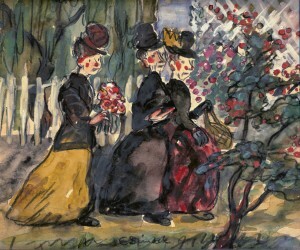 Dimock also purchased works from the Armory Show for the Glackens’ own collection, including a drawing by Walt Kuhn and another by Maurice Prendergast. Charles Musser, “1913: A Feminist Moment in the Arts,” in The Armory Show at 100: Modernism and Revolution, Kimberly Orcutt and Marilyn Kushner, eds., exh. cat. (New York: New-York Historical Society, 2013), 171. Milton Brown, The Story of the Armory Show, 2nd. ed. (New York: Abbeville Press, 1988), 262. Quinn apparently changed his mind about the watercolors after he agreed to purchase them stating that “I am not especially crazy about the two Dimock things, and I think I can get some more amusing ones of her’s [sic] at some other time.” Nevertheless, he agreed to go through with the sale. See John Quinn, New York, to Walt Kuhn, June 3, 1913. Elmer Livingston MacRae Papers, Archives of American Art, Smithsonian Institution, Treasurer’s Records C3, box 1, no.7, 22-24. Harriet Monroe, “Art Show Open to Freaks,’ Chicago Tribune,” February 17, 1913, 5. “American Pictures at the International Exhibition Show Influence of Modern Foreign Schools,” New York Times, March 2, 1913, 6. William H. Gerdts, William Glackens (New York: Abbeville Press, 1996), 99.